We are the 'Community Church on the High Street' serving Haslemere, Hindhead, Beacon Hill, Fernhurst and the surrounding villages. 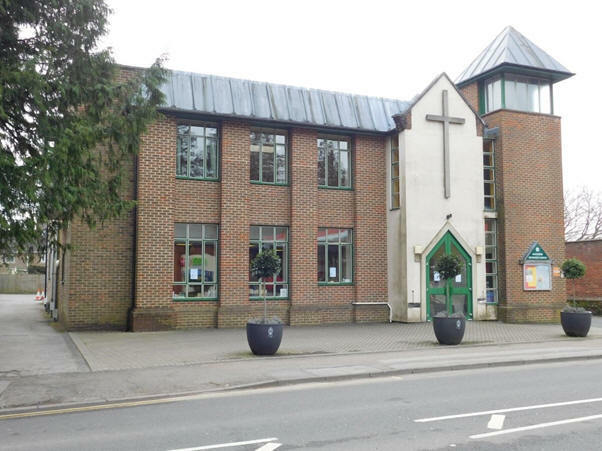 There are close links with the other churches in the area, and we are the centre for many community activities during the week, including the Haslemere Food Bank. Call in for coffee / tea / chat on Tuesday, Wednesday, Friday or Saturday mornings from 10 am to 12 noon in the Open Door Lounge and discover more. Major improvements are currently being made to the building, to the standard of the audio-visual technology in the main church area, and to the lounge and catering facilities, with the installation of a modern kitchen. The "Open Door" coffee lounge is now in use, providing refreshments, warmth, conversation and good company from 10am till noon, 4 days a week. The updated facility is popular with all who use the building. The church sanctuary is now undergoing refurbishment, which is almost completed.